Wendell Lewis Willkie (February 18, 1892 – October 8, 1944) was an American lawyer, politician and statesman, and the dark horse Republican nominee for the 1940 presidential election. He lost to Franklin D. Roosevelt, then joined Roosevelt's team as a roving ambassador. He never held any political office. Born in Elwood, Indiana, the son of Herman Willkie, a German immigrant. He graduate Indiana University and IU Law School. After service in World War I, he moved to Akron Ohio, and (in 1929) to New York as legal counsel for the Commonwealth & Southern Corporation, the country's largest electric utility holding company. He became president in 1933. Willkie was been an active campaigner at the 1932 Democratic National Convention, and supported Roosevelt actively in 1932. Soon after the election, Roosevelt proposed legislation creating the Tennessee Valley Authority, to provide cheap electricity and modernize the backward Tennessee Valley. TVA competed with existing power companies in the area, notably Commonwealth & Southern. This prompted Willkie to become an active critic of the New Deal, especially the TVA. Willkie said it would be unconstitutional for the federal government to enter the utility business, and now this was quickly becoming reality. In April of 1933, Willkie testified against the TVA legislation before Congress. His testimony led the House to limit the TVA's ability to build transmission lines that would compete with existing utility companies (including C & S). However, Roosevelt got the Senate to remove those restrictions and the resulting law gave the TVA extremely broad power. Because the government-run TVA could borrow unlimited funds at low interest rates, C & S was unable to compete, and Willkie was forced to sell C & S to the TVA in 1939 for $78.6 million. Willkie formally switched parties in 1939 and began making speeches in opposition to Roosevelt's New Deal. Prior to 1940 Republican National Convention (held in Philadelphia that year), three candidates had emerge during the Republican primaries. These were Senator Robert Taft of Ohio, Senator Arthur H. Vandenberg of Michigan, and New York City District Attorney Thomas E. Dewey. All three had campaigned vigorously during the primary season, but this had resulted in only 300 of the 1,000 convention delegates being pledged to a candidate by the time of the convention. Thus, the convention was ripe for the selection of a dark horse candidate. As a Wall Street-lawyer who had never before run for public office, Wilkie seemed to be an unlikely candidate to win the nomination, especially since he had been a Roosevelt delegate at the 1932 Democratic National Convention. But because Wilkie had strong backing from media magnates, such as Ogden Reid of the New York Herald Tribune, Roy Howard of the Scripps-Howard chain, and John and Gardner Cowles, publishers of the Minneapolis Star, the Minneapolis Tribune, the Des Moines Register, and Look magazine. These publishers helped build a powerful grass-roots network of support. However, despite such support, a May 8 Gallup poll showed Dewey leading at 67% among Republicans, followed by Vandenberg and Taft, with Willkie at a mere 3%. To isolationists Willkie seemed one of them, saying, "No man has the right to use the great powers of the Presidency to lead the people, indirectly, into war". The next day headlines blared, "Mus Avoid War, Wilkie Declares." The Nazis' rapid blitz into France shook public opinion to its roots, even as Taft was telling a Kansas audience that America must concentrate on domestic issues to prevent the New Deal from using the international crisis to extend its powers at home. In New York Republican Congressman Hamilton Fish III warned that Roosevelt had become Churchill's willing accomplice in leading his nation to war against Germany to make the world safe for international communism. He denied being an isolationist, saying he was actually a non-interventionist who wanted negotiated settlements of disputes rather than American involvement in foreign wars. Nevertheless, sympathy for the British was mounting daily. By mid-June, little over one week before the convention, Gallup reported Willkie was in second place with 17% as Dewey started slipping. Willkie was stumping the country getting the votes of businessmen and German-Americans. (His father was a German immigrant.) As the delegates were arriving at Philadelphia, Gallup reported Willkie had surged to 29%, Dewey had slipped 5 more points to 47%, and Taft, Vandenberg and Hoover trailed at 8, 8, and 6% respectively. Hundreds of thousands, perhaps as many as one million, telegrams urging support for Willkie poured in, many from "Willkie Clubs" that had sprung up across the country. Millions more signed petitions circulating everywhere. At the convention itself, keynote speaker Governor Harold Stassen of Minnesota announced for Willkie and became his official floor manager. Hundreds of vocal Willkie supporters packed the upper galleries of the convention hall. Willkie's amateur status, his fresh face, appealed to delegates as well as voters. The delegations were selected not by primaries but by party leaders in each state, and they had a keen sense of the fast changing pulse of public opinion. Gallup found the same thing in data not reported until after the convention: Willkie had pulled ahead among Republican voters by 44% to only 29% for the collapsing Dewey. On the first ballot no one came close to a majority. As delegates belonging to "favorite son" candidates were released, the incessant cries of "We want Willkie" inside the hall mirrored not only public opinion at home, but the political calculus inside the heads of the delegates. They decided Dewey was a loser, and Willkie could be the big winner in the fall. Finally, on the sixth ballot, he received a majority of the ballots cast and won the nomination. Having given little thought to who he would select as his vice-presidential nominee, Willkie left the decision to convention chairman Joe Martin, who suggested Senate Minority Leader]] Charles L. McNary of Oregon. 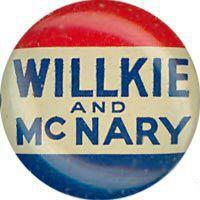 Despite the fact that McNary had spearheaded a "Stop Willkie" campaign late in the balloting, the candidate picked him to be his running mate and McNary was nominated by acclamation. After the election, Willkie became one of Roosevelt's most unlikely allies. To the chagrin of many in his party, Willkie called for greater national support for controversial Roosevelt initiatives such as the Lend-Lease Act and embarked on a new campaign against isolationism in America. In July 1941, he urged unlimited aid to the Britain in its struggle against Germany. That same year he traveled to Britain and the Middle East as Roosevelt's personal representative, and in 1942 visited the Soviet Union and China in the same capacity. In 1943, Willkie wrote One World]], a book that called for international peacekeeping after the war. Extremely popular, millions of copies of the book sold. Also in 1943, Willkie helped to establish Freedom House together with Eleanor Roosevelt . In April, 1941 Willkie joined the law firm of Miller, Boston & Owen and shortly thereafter changed the name to Willkie, Owen, Otis, Farr & Gallagher (and presently, Willkie Farr & Gallagher LLP). In the 1944 presidential election Willkie once again sought the Republican nomination, choosing his wife's hometown, Rushville, Indiana, as his campaign headquarters. But his liberal internationalism gained little support due to the rightward shift of the Republican Party. Willkie did not support the eventual 1944 Republican nominee, Thomas Dewey. Willkie began working with the new Liberal Party of New York to launch a new national party, but his unexpected death ended that movement. After surviving several heart attacks, Willkie died of one at age fifty-two. Shortly before Willkie died, he told a friend, that if he could write his own epitaph and had to choose between "here lies a president" or "here lies one who contributed to saving freedom," he would prefer the latter. Eleanor Roosevelt eulogized him as a "man of courage.... (whose) outspoken opinions on race relations were among his great contributions to the thinking of the world." She concluded, "Americans tend to forget the names of the men who lost their bid for the presidency. Willkie proved the exception to this rule." Willkie's name was prominently mentioned by keynote speaker and Democratic Senator Zell Miller at the 2004 Republican National Convention. Miller praised Willkie as a politician who embodied a non-partisan spirit of co-operation during wartime and praised his support of President Roosevelt's creation of a military draft. He compared John Kerry negatively and blasted the senator for being critical of President Bush's foreign policy. State of the Union, a play by Howard Lindsay and Russell Crouse which was filmed by Frank Capra in 1948, is loosely inspired by Willkie and the role played in his campaign by his mistress Irita Bradford Van Doren. Willkie is also featured as a character in Philip Roth's counterfactual history novel, The Plot Against America, in which Willkie opposes Charles Lindbergh in the 1944 presidential election. Madison, James H., ed. 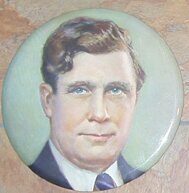 Wendell Willkie: Hoosier Internationalist. Indiana U. Press, 1992. 184 pp. This page was last modified 16:26, 15 April 2012.